Joy Creek Photo Archive (c) all rights reserved Africa. 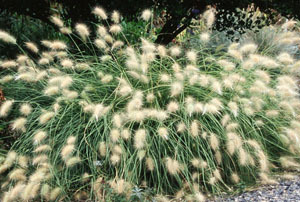 The common name of Pennisetum villosum (feather grass) describes this grass when it is in bloom. Cascades of creamy white, plume-like inflorescences that are hard to resist. July to August. 2.5 ft.